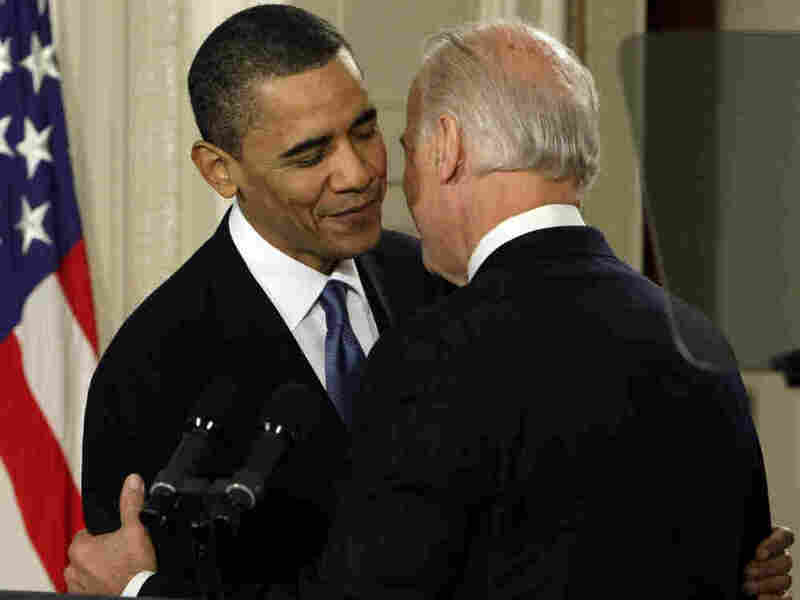 Biden's 'F-Bomb', Palin's 'Refudiate': What Other Top Quotes Got Missed? : The Two-Way What was said in 2010 that really stands out in your mind? We're taking suggestions. We posted yesterday about Yale University librarian Fred Shapiro's "best quotes" of 2010 list -- asking that Two-Way readers try to break the tie at the top between Delaware Senate candidate Christine O'Donnell's "I'm not a witch" and former BP CEO Tony Hayward's "I'd like my life back." In the contest between those two, Hayward is winning right now. His quote is the choice of 59% who answered our question, to 37% for O'Donnell's. There's a third option in our question, and a suggestion that perhaps some very quotable quotes got missed and should have been on the 2010 Top 10. Two-Way readers have offered some thoughts about that. What about these? -- Vice President Biden dropping an F-bomb when he told President Obama that passage of the health care overhaul was "a big f-ing deal." -- 2008 Republican vice presidential nominee Sarah Palin tweeing "peaceful Muslims, pls refudiate" the so-called Ground Zero mosque. -- New York gubernatorial candidate Jimmy McMillan and his "rent is too damn high" movement? -- YouTube phenom Antoine Dodson and "hide your kids, hide your wife, and hide your husband, 'cause they're rapin' everybody out here." -- Then-JetBlue flight attendant Steven Slater's intercom rant about the "f-ing @#$%$#@ who told me to @#$-off", just before he popped the jet's door open and slid down the emergency slide. And, of course, the best quotes don't have to be outrageous or funny. For instance, Haiti's first lady, Elisabeth Preval, saying "I'm stepping over dead bodies" after her nation's devastating earthquake. Add others in the comments thread, if you wish.